After a long hiatus from doing what I love to do, finally TeamTehTarik is now back online, doing what we all do best! Throughout this time, it was a torturous time for myself and the rest of TeamTehTarik, watching as the number of our traffic went down the drain while we suffered to conquer what I billed as one of the Worst Moments of My Life, the Certificate of Legal Practice exams (for law student readers out there, if you are thinking of taking this exams instead of the Bar, find a cliff and jump off it. Its less painful that way). So, while I was gone, A LOT of things happened. So best if I was to get this blog up to date before going to the new things that I will include in my post. TeamTehTarik feat. at Project Alpha Season 3! 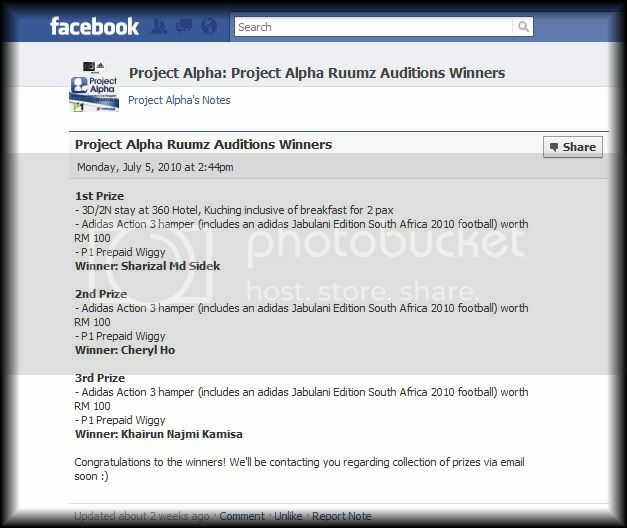 As for most of you who has been following this blog, many would be aware that I recently auditioned for the blogger reality TV show Project Alpha with hope that I would get chosen to be featured for the show (for those of you who have no idea what I am talking about, you guys can read my post on my auditions here. As you can see above, TEAMTEHTARIK WON THE COMPETITION!!! Quite honestly winning the thing is still a surreal moment for me and I have everyone supporting me to thank for. From a humble blogger to get this much support, its a flattering gesture I can tell you that. So, expect to see more of myself and the Team running around Nuffnang's events as well as involved with many of Project Alpha's escapade. Plus, would want to reach out a special congratulations to Sdri. Khairun for winning the third place! (would want to put her link in this post but can't seem to find where her blog is!). Again for those who have been following this blog, I wrote a post about me joining in the Proton Saga Snap and Win Competition (read more about it here!). Unfortunately, fortune never really did favor me for the competition and although I was nominated for the top 10 pictures of the competition, I never did win anything out of it. Regardless, it was a great ride and really grateful for those supporting me for the competition. So, what now for MoaTTD? My absence from the blogging world has really restricted me from doing or posting so many things that I wanted to share before, and now the shackles are out and expect to see a lot of changes and new post from now on.
" Feels good to be back..."
Nang this post if you like it. Thanks guys! So you're coming to Kuching?? Welcome to my hometown! welcome back!! nice to see u here again! haha finally the jig is up. ppl gonna know my real name! graet to be back Jr.
haha of course not. its already up! seems like it! gonna really enjoy the visit there! yup, based on what I was told they are gonna feature me in the show next season. lets see how that turns up! thank you very much! feels great to be back!